Once a year Baltimore opens her arms wide to welcome the Otaku of the world. 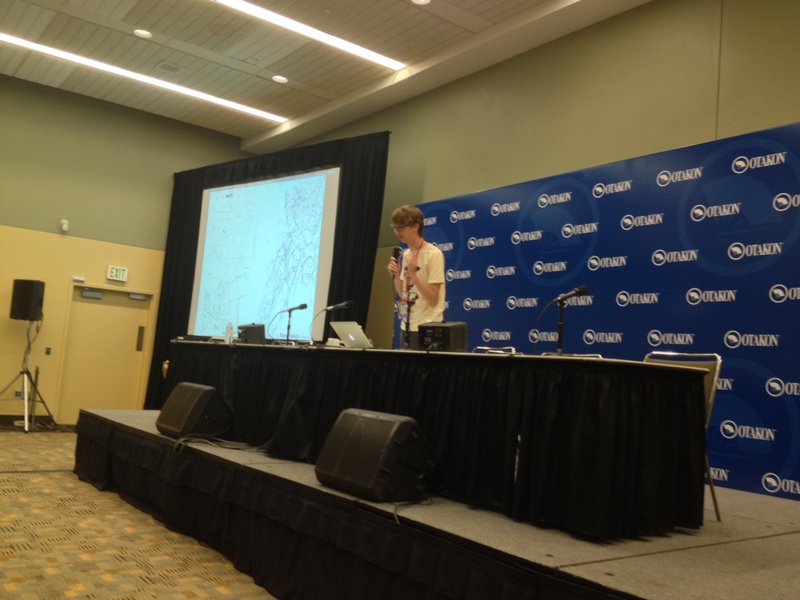 This year, on the 20th anniversary Otakon, her arms were open even wider. The con felt more alive and more packed than ever before. From the minute I arrived in town to the minute I left, I felt the love and warmth around me. And that wasn’t just the summer heat. Over the past few years I have developed friendships with many people within the anibloggers/podcaster community through Twitter and Facebook. Otakon has become the place where I can actually wind down and hang out with these very same people in person, and I look forward to it all year. This year was certainly no exception. I got to spend time chatting, drinking, and laughing with so many wonderful people. I was even able to meet a few people for the first time. This convention honestly wouldn’t be as great without them. 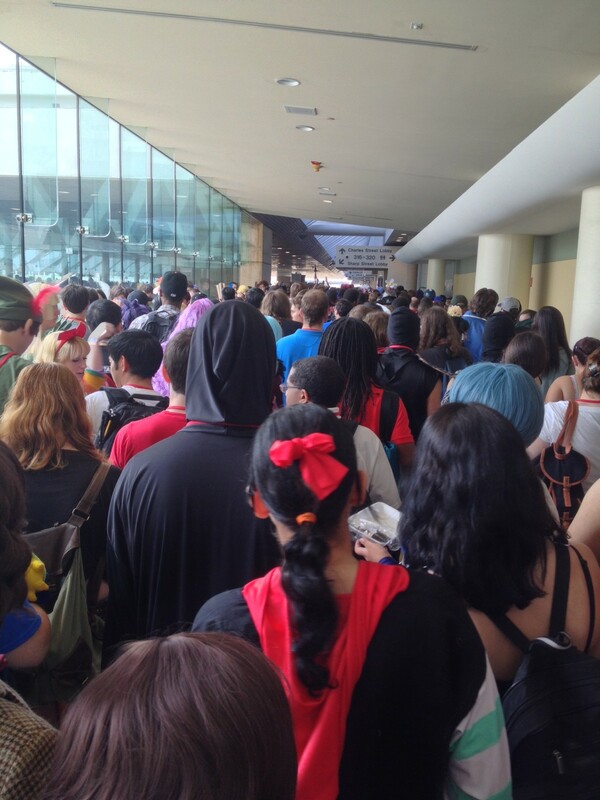 This was my first year of Otakon where I had to wait in a line that stretched outside and around the corner to pick up my badge. 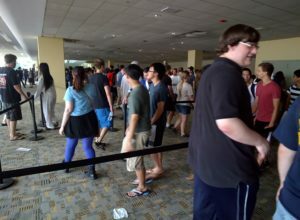 Luckily enough Otakon had the registration booths fully staffed and was able to move the line along very quickly. The next line I had to wait in was a line to walk down the hall. This happened several times during the weekend. I was trying to get from the Hilton to the Sharp Street Lobby around 11am on Friday in order to line up for Yoko Kanno tickets. As soon as we got to the sky bridge between the Hilton and the BCC the crowd of people came to a stop. For anyone who doesn’t know, there is one narrow staircase between the sky bridge and the BCC. This creates a huge bottlenecking problem. This year was worse than ever. The bottlenecking affected the space all the way past the sky bridge and almost back in to hotel space. Once we finally made it out of there we came up to the hallway connecting the first part of BCC to the second. We came to a complete stop. The hallway just couldn’t handle the massive amounts of people. Staff even had to get called in to maintain a two-way flow. When we got to where we had to take the stairs down to Sharp Lobby we encountered a wall of people that seemed impossible to pass. Luckily everyone was very understanding and graciously moved as much as they could out of the way to let us squeeze by. As soon as we got through that line we hopped right into the Yoko Kanno ticket line, but by that time, it was already too late. All the tickets were already gone and I would have to try again the next day. Although tickets weren’t scheduled to be given out until 1:00 pm on Saturday, I decided that in order to get tickets I would line up at 9:30 am. The line was already outside the marked line-up area by the time I got there. 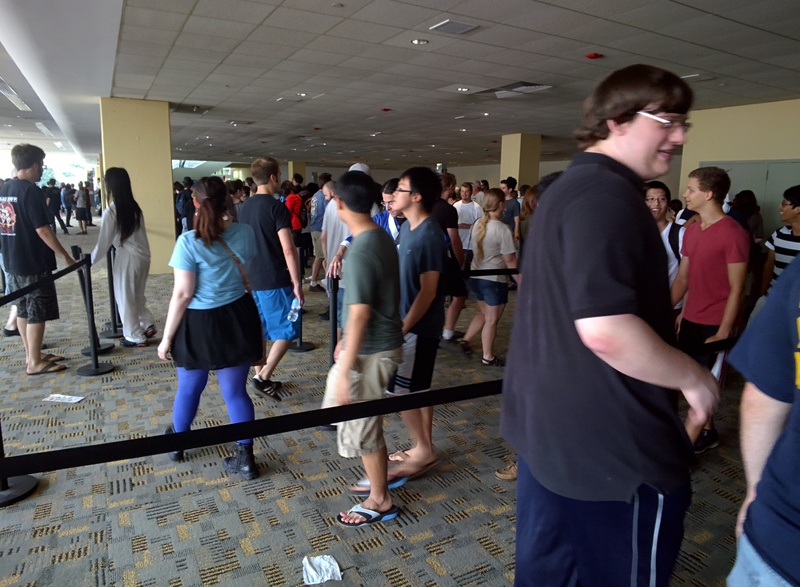 I decided to Tweet out about the length of the line which seemed to catch a few people’s attention. They began cutting off the line at noon, and this angered many people who weren’t able to make the line in time. I can honestly say that this is the longest I have ever waited in line for something, and a few times I even questioned myself as to why I was doing this. I was missing many panels and cutting down on time I had laid out to walk the Dealer’s Room and Artist Alley. Not long after that, a few girls started shouting Marco Polo. And I almost lost it. This brings me to my biggest annoyance of con culture: the meme shouting. It seemed that for the last two years everyone had greatly matured. I barely heard any shouting last year and even a few times where people were discouraged from doing it. Apparently it was too much for people and the great maturity experiment ended. I heard Marco Polo on average ten times a day. While in line for Yoko Kanno those girls shouted it once every 2-5 minutes. I had a heavy wand and wanted to bash some heads. I heard buttscratcher at least twice a day. At one point Saturday night a girl walked down the line I was in and tried to get people to play Duck Duck Goose with her. She picked Scott who just looked up at her, shook his head slowly, and simply said “No.” She just continued to go up and down the line trying to get someone to chase her. There were a few new ones I didn’t quite understand but was equally annoyed. This is seriously a big part of con culture I wish would just die and never come back. Maybe I’m just getting old? I heard there were lots of amazing panels this year, and I really wish I had more time to have attended them all. This is one thing that I have come to realize when it comes to the big cons versus small cons. At smaller cons I will attend five or six panels a day. Sometimes even more. But at bigger cons like Otakon, I can only make three or four because I have to line up an hour before to make it into the room, or I miss a panel because I have to line up for something else. I was able to attend was Charles Dunbar and Daryl Surat’s “We Con, Therefor We Are:…”. This was a semi roundtable talk/discussion about the history and genesis of the anime convention and what that means. They talked about how anime conventions had their roots in older sci-fi cons and were born out of a need to have a bigger space of their own. They talked about how Henry Jenkins’ Convergence Theory plays in to the growth and change of anime cons. 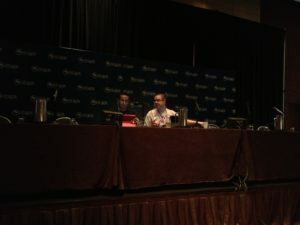 The next panel I was able to attend was Evan Minto’s “Beautiful Backgrounds of Anime”. I had never seriously given thought to background art in anime, but this panel opened my eye to the beauty and often complexity of the art that goes into them. You don’t always stop to think, “Wow, someone actually took time to create these wonderful pieces of art that people may not even notice.” Even the more simplistic ones have huge depth and beauty and Evan was able to point out the intricacies in many of them. Immediately after I attended the first part of Vincenzo Averello’s “Science in Anime” panel with co-panelist, Evan Minto. The panel started off not with an anime persay but an actual animation that was used to describe genetics. It was actually very fascinating. Evan shared a scene from Eden of the East where the group discovers a roving bug in their phone. Evan explained that roving bugs were very real. It’s a program that your phone provider can remotely install onto your phone which will covertly turn on your mic and record anything it picks up without any indication even if the phone is off. The only way to stop it is to take the battery out. Phone companies do this for the government with warrant, or so they say! I had never heard of a roving bug before so I definitely learned something. My convention schedule ended with the Yoko Kanno concert I had waited over 3 hours in line for. Before I say anything about the concert I have to say that the wait was well worth it and if I had to do it again I will. The first performer was actually Chiaki Ishikawa. She has a breathtaking voice and her set was supplemented by some very strange but equally mesmerizing video and graphics. Unfortunately the simulcast room next door that was broadcasting the concert for those who could not get tickets only showed the videos and did not show Ms. Ishikawa at all. The Otakon boards report that there was a lot of miscommunication between those running the concert and the people who ran the video feeds. After a 15 minute intermission Yoko Kanno finally came on stage. She wore an adorable dress with a long flowy back and ears. Her piano was also in the shape of what appeared to be a dog and her piano stool had a long tail flowing back. It was all covered in white, and I soon found out why. During her performance they lowered the lights and animations were projected onto the piano. It was fascinating and everything really added to the experience. Piano Me was absolutely stunning and I really wish I could have shared some moments from it but there was a strict no photos or videos policy. 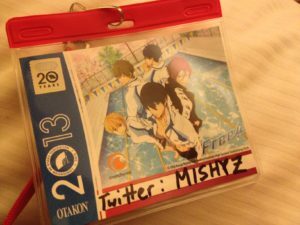 I can honestly say that this has been one of the most hectic but equally memorable Otakons I have ever attended. 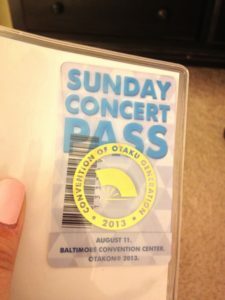 I’m already looking forward to Otakon 2014. MishyZ is a new contributing author to this blog. Please direct all love and hate to her at michelleyezhang AT gmail.com or Tweet her @ MishyZ. This entry was posted on Wednesday, August 14th, 2013 at 9:42 pm by MishyZ	.